Whether you've committed to a new, healthy lifestyle or just want to blend up the most awesome margaritas at your next pool party, we have the right blender or juicer for you. Learn more about the difference between a blender and a juicer, available features, and healthy, fun uses for each. a blender and a juicer? Blenders mix all of your ingredients together, essentially demolishing whatever you put into the blending container. Most people use blenders for smoothies, frozen concoctions, soups, and other foods that need to be broken down or mixed together. Some small appliances like the Nutri-Bullet may be called "extractors," when they are truly blenders because they retain all of the original ingredients in the finished product. Juicers, on the other hand, extract only the liquid juice from fresh fruits and vegetables, leaving behind pulp. A current health food trend, these specialized kitchen devices can make eating your daily fruits and vegetables and absorbing the vitamins and minerals in the juice as easy as your morning pick-me-up. What produces a more nutritious beverage? Some claim that it's better for the body to absorb the pure juice extracted from fresh ingredients, while others tout the benefits of ingesting the accompanying fiber from those ingredients as well. The jury is still out, medically, on which is better for your health, but if either a juicer or a specialized blender gets you eating more fruits and vegetables, you'll be a winner. Blenders come in many shapes and sizes; you may find you need to own more than one type to suit your food preparation needs. These 8- to 20-oz. personal blenders work great if you want a smoothie for breakfast every morning. Some models blend directly in a portable cup, making it easy to take your beverage on the road. Some models feature multiple cups, lids and blades for versatility. Blenders with larger pitchers (usually 48- to 72-oz.) come in handy if you're blending drinks for more than one person or making soups, salsas, puddings and other delights. A high-performance blender with an ultra-powerful motor can liquefy even hard foods, make ice cream in seconds, and even shred meat. Powerful motors can mean powerful noise, though. Be prepared to wake the household. Hand or immersion blenders allow you to mix directly in a pan or bowl; you don't have to dump hot ingredients (like soup) into a separate pitcher. Lightweight and easy-to-store, these flexible devices can replace your mixer or food processor when you want to combine smaller quantities of food or when you don't want to transfer awkward ingredients to your traditional blender. These specialized, powerful machines will crush and incorporate ice evenly into your specialty drinks, smoothies, snow cones and more. Look for a machine with a large, insulated ice reservoir and a powerful motor. Some models even include multiple pitchers for versatility. If you don't have a lot of counter space or just want to consolidate your small appliances, find a blender with multiple attachments, including a standard pitcher, a food-processing bowl, chopper, or a to-go cup, so you can make the most out of just one machine. If you need to chop nuts, vegetables and other ingredients for recipes, consider a food processor. Blenders work best to liquefy ingredients while food processors are more suited for dry ingredients. Blenders come with a wide variety of features. Here are just a few and why you might want them (or want to steer clear of them). In general, a more powerful motor will tackle harder foods or ice cubes. Hand mixers or lower powered blenders start at around 200 watts, while high-performance blenders (the kind used by professionals) top out around 2,000 watts (or 2 horsepower). Keep in mind that if you try to crush hard foods in an under-powered unit, you may burn out the motor. If you plan to blend a variety of foods, invest in a machine with multiple speeds; if you want to fine tune the mixture, shoot for variable speeds. And a pulse function can help in crushing hard items. In fact, the pulse function is often the most versatile, allowing ingredients to settle before continuing to chop them. You may find it easier to clean up a blender that has flat, touchpad controls. For convenience and safety, many blenders feature a dishwasher-safe pitcher and removable blades. Machine: Solid, durable materials as well as rubber feet help keep your machine stable while it's operating. Pitcher: Glass, metal, or high-grade plastic — for instance, Eastman Tritan — pitchers are usually more durable. A standard lightweight plastic pitcher, if scratch-resistant and BPA-free, may satisfy your needs. Cover: A tight seal is very important to avoid sticky messes. Blade: Make sure it's stainless steel for long-lasting use without sharpening. If you'll be storing your blender on the countertop or pulling it out for a party, you may want to invest in a cool, retro blender or a sleek, sophisticated stainless-steel model. Study after study shows that most Americans don't eat enough fruits and vegetables. Juicers make it easy to consume more servings of these healthy nutritional elements. Plus, vitamins and minerals in juice extracted from fresh fruits and vegetables are absorbed more quickly into our bodies, especially for those with impaired digestive systems. Fresh, homemade juice will retain essential nutrients lost during the pasteurization process of almost all store-bought juices. Plus, it will be free of added sugars and preservatives found in these commercial brands. After you insert your fruits and vegetables, the machine uses various spinning, grating, squeezing and pressing methods to separate the liquid from the pulp in the ingredients. Juice pours out of one area, while the resulting pulp is stored either inside the machine or in an external bin. Fiber-rich, leftover pulp adds texture and flavor to soups, pasta dishes, muffins, cakes, and more. There are three types of juicers: citrus press juicer, centrifugal juicer, and masticating juicer. Read on to discover which one is right for you. Simple and often less expensive, available in manual and electric versions, a citrus press makes fresh squeezed orange juice, lemonade and more by squeezing the juice out of those fruits. You can enjoy additive-free, natural juice in no time. When shopping for a citrus press, consider size, ease of cleaning, and noise level. Take note of how much pressure the juicer exerts, because this translates into how much juice you'll extract from your fruit. Some presses will regulate the pulp that ends up in your glass. Also think about how much time you'll want to invest in cleaning the machine; more moving parts usually means more complicated cleanup. Finally, juicing can be a noisy business. If you don't want to wake up the family in the morning, opt for a higher-end model with a quieter motor. If you want to get into serious juice extraction from ingredients other than citrus fruits, you should invest in a centrifugal or masticating juicer. Centrifugal juicers extract liquid from fruits and vegetables by spinning them against a strainer or grater. The juice flows out through a spout and the resulting pulp is either left inside, or in some models, ejected into a pulp container. Masticating juicers, sometimes called "slow" juicers, crush or compress your ingredients to extract juice and nutrients. The leftover pulp tends to be dryer since they squeeze out more juice. Masticating juicers still juice quickly, just a little more slowly than centrifugal juicers. Which juice extractor is best for me? Though more bells and whistles increase the price of each, centrifugal juicers tend to be less expensive than masticating juicers. What kinds of ingredients do I want to juice? If you want to juice only fruits and vegetables, a centrifugal juicer will probably fit the bill. However, if you want to juice wheat grass, and extract more juice out of leafy greens like spinach, kale and herbs, you probably should invest in a masticating juicer. How much time do I have to clean my juicer? Juicers should to be cleaned after every use to avoid a sticky mess — and some take longer to clean than others. You may be tempted to save a little money on these features, but let's face it: the harder it is to clean, the less likely you'll be to use your new juicer. Fewer parts mean fewer pieces to clean. Removable, dishwasher-safe parts clean up more easily. Rounded corners on internal cavities can make removing stubborn pulp and juice much easier. Many juicers have external pulp containers, sometimes with easy-empty bags. Those without external containers will require more cleaning. In addition, some "self-cleaning" masticating juicers feature built-in scrubbers that clean and keep pulp from clogging the screen during the juicing cycle. After juicing you'll probably still need to clean the juicer, but you won't need nearly as much elbow grease, especially on the screen. How much time do I want to spend on prep? Many centrifugal juicers feature a large food chute that will accept whole fruits, including apples. You'll reduce your food preparation time considerably with one of these machines. Most masticating juicers, especially ones oriented horizontally, will accept only smaller ingredients, so get your cutting board ready. Does the foam on juice bother me? Some people just don't like the taste of this naturally occurring foam, while others believe the air bubbles in the foam cause a gassy feeling when ingested. Foam or froth is produced more commonly from the high-speed spinning action of a centrifugal juicer. Some centrifugal models feature froth or foam separators that will strain the foam from your juice, leaving your juice much clearer. Masticating juicers, because they operate somewhat more slowly, with a pressing or grinding motion, usually don't produce as much foam. How long do I want my juice to last? Fresh juice should be consumed as soon as possible, and if stored, should be kept in an air-tight container in the refrigerator. Because centrifugal juicers produce more heat and resulting oxidation, juice from these machines should be consumed within eight hours. Properly-stored juice from a masticating machine may last up to 72 hours. 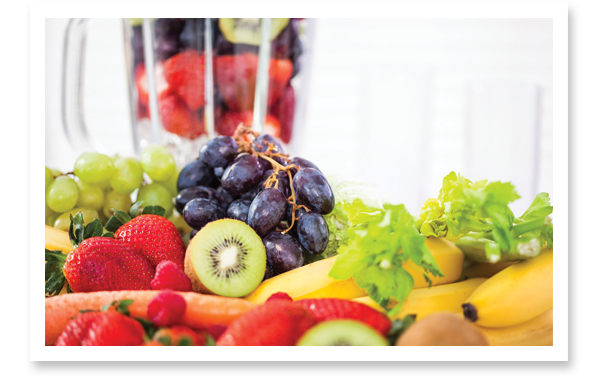 Soft fruits like grapes can be easier to juice slowly while carrots and root vegetables work better at high speeds. The ability to customize your juicing session can save time and frustration. If you're juicing for a crowd, you may not want to stop and empty either the pulp bin or your juice container, so make sure both have ample space. Do you plan to make a lot of juice in the morning when others are still asleep? Choose a quieter juicer. Centrifugal juicers, because of their high speeds, tend to be louder, while the slow speeds of masticating juicers are much quieter. You want your juicer to stand the test of time. Look for quality, metal parts, and stainless-steel blades. As with all appliances with blades and gears, your juicer should be heavy enough to stay stable on your countertop and have rubber feet to deter movement while it's operating. Since your juicer will probably be featured on your countertop, you want it to look good. A new snazzy, sleek juicer in the kitchen can be a great conversation piece. 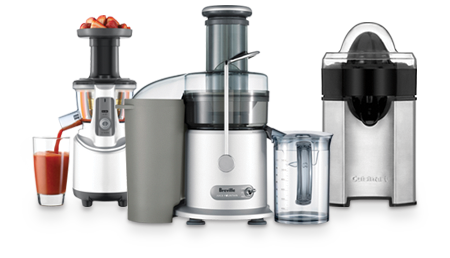 Find a wide variety of blenders and juicers on BestBuy.com. Your local Best Buy store also has a selection of both small appliances. Plus, our friendly Blue Shirts are there to answer questions and help with choosing the best small appliances for your needs.